Houston, Texas – The pro-life operatives who took undercover videos in Planned Parenthood facilities and were indicted by a Harris County, Texas, grand jury, have been offered pretrial diversion in the criminal cases against them say attorneys for the pair. Harris County District Attorney Devon Anderson made this announcement at a Republican Women’s Club event in Kingwood, Texas, on Saturday evening. Anderson said she wanted to “address the elephant in the room.” Anderson was the keynote speaker at the event in which Breitbart Texas’ Bob Price served as Master of Ceremonies. Successful completion of pretrial diversion would result in the cases being dismissed by the prosecution. 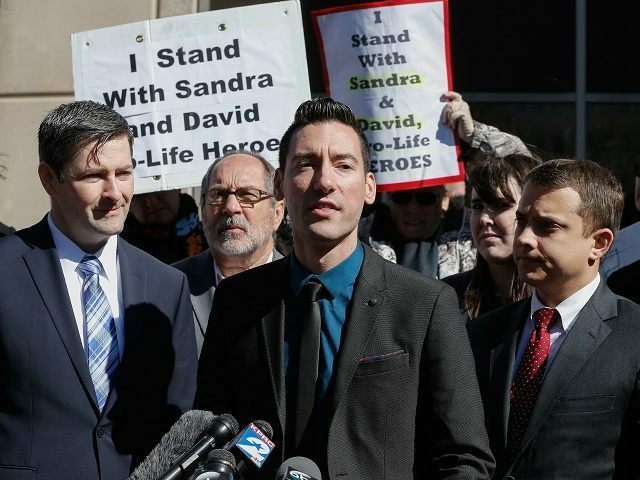 The indictments of David Daleiden and Sandra (Susan) Merritt by a Harris County grand jury surprised pro-life advocates who were expecting that an investigation of Planned Parenthood Gulf Coast would result in criminal action against Planned Parenthood executives for selling baby body parts. Planned Parenthood Gulf Coast is a mega-abortion facility located in Houston, Texas, and was one of the facilities stung by the undercover videos produced by Daleiden and Merritt, as reported by Breitbart News. Daleiden is the president and founder of the Center for Medical Progress (CMP). Both Daleiden and Merritt are well-known for the series of undercover videos with Planned Parenthood executives and employees. A research director at Planned Parenthood Gulf Coast in Houston was the subject of one of these videos. Lt. Governor Dan Patrick immediately publicly condemned the video, the fifth in the CMP video series, and asked Harris County DA Devon Anderson to conduct an investigation, as reported by Breitbart Texas. As a result of the investigation, there have been no indictments involving Planned Parenthood; however, Daleiden and Merritt were indicted for felony tampering with a government record. Daleiden was also indicted for the misdemeanor charge of offering to buy fetal tissue. This offense is a Class A misdemeanor unless the actor’s intent is to defraud or harm another, then it is a state jail felony. Both Merritt and Daleiden were charged with felonies. California driver licenses were attached to both pro-life activists’ indictments. During her speech before the Republican Women’s Club, Anderson said the First Amendment does not protect from prosecution of the crimes. Daleiden was also charged under the statute relating to the purchase or sale of human organs. During the Saturday night event, Anderson expressed surprise that the document tampering charge was a felony while the purchase or sale of fetal tissue or body parts is a misdemeanor. She challenged the Texas legislators that were present in the room to take action on that issue in the next legislative session. Breitbart Texas spoke with Peter Breen, one of the lawyers for Daleiden. He said Daleiden was immediately offered pretrial diversion and added, “This is a good first step.” Breen continued, “This is a good indicator that the charges are not that strong, to immediately go from 20 years to something that does not require a guilty plea.” Breen says his client has not taken the deal. One thing the lawyer says, Daleiden will expect an apology. Breen is a lawyer with the Thomas More Society. He says Daleiden’s defense team will be filing a Motion to Quash the indictments in the near future. Breen is representing Daleiden along with lead counsel Terry W. Yates and co-counsel Jared Woodfill. Breitbart Texas also spoke with Mat Staver, founder and chairman of Liberty Counsel. He and others are representing Sandra Merritt. Staver said during the interview, “An offer for pretrial diversion was made even before we appeared in court.” He said the offer came early last Wednesday before Merritt turned herself in. He stated the deal would involve reducing the charge from a felony to a misdemeanor with no guilty plea. He explained that local defense counsel told him they have never seen such an offer occur in Harris County prior to a defendant coming to court. Staver said his client has not accepted or rejected the deal. Staver is serving as counsel along with Houston lawyers Dan Cogdell and Chris Downey. Harry Mihet of Liberty Counsel is also assisting with Merritt’s defense. Staver was emphatic that his client “did not violate any statute or criminal law.” He added that he would like to investigate how the indictment came about, and the basis of the prosecution. He called the indictment “outrageous” and “unexpected” and said Merritt’s lawyers would be moving forward with discovery. Staver said he wanted to know how the grand jury could start an investigation into Planned Parenthood but wind up with an indictment against the undercover journalists. Houston criminal defense lawyer Grant M. Scheiner told Breitbart Texas that “pretrial diversion” is a contract between a defendant and the prosecutor whereby if the defendant does everything he is supposed to do, for example community service, then the prosecutor is contractually obligated to dismiss the case. The defendant is also prohibited from committing any crime during the pretrial diversion period. In addition to these cases, Daleidon has been sued by the National Abortion Federation and Planned Parenthood Federation of America. Breen is representing him in these and other cases. As reported by Breitbart News, these abortion groups claim that Daleiden lied on government papers when setting up the tax-free group, and lied to government officials in getting false identification. They have also accused him of falsifying government documents in setting up a corporation he used to gain access to Planned Parenthood offices and conduct his undercover operations. Breen told Breitbart Texas that a preliminary injunction has been entered by the judge in the National Abortion Federation case. The order entered Friday prevents the Center for Medical Progress from releasing videos taken at National Abortion Federation meetings in 2014 and 2015. The case is being decided in San Francisco, California, by a federal judge appointed by President Obama. Both Daleiden and Merritt are scheduled to appear in court in Houston on March 28.